The best keto snacks are convenient to grab between meals, when eating low carb to-go and when you’re short on time. These fast keto snack ideas are high fat, high protein and super low in sugar – perfect for Atkins or stall-breaking. The best keto snacks have protein, healthy fats and fiber. The most nutritious high fat snacks double as mini low carb meals. “Low carb” isn’t really enough. Why settle when you can have more? We want nutritious snacks with slow carbs from fiber, and fats from the healthiest sources. These keto snacks are higher in fiber and nutrients, have carbs with a lower glycemic index, are balanced with quality proteins and include heart-healthy fats. Grab the list of 100 snacks perfect for keto and Atkins. Click the image to view, print or save. Snacks are a great way to try out low carb versions of your old favorites, and a way to practice eating carb-controlled portions. If you’re unusually hungry between meals, adding more healthy fats to your main meals keeps hunger away for longer periods of time. When you’ve been eating low carb for a few months (or fat-adapted), the urge and need to snack dwindles. Now, snacks are useful for to-go lunches, parties, appetizers, side dishes and mini-meals. Hard boiled eggs are a perfect high fat snack. Instant Egg Salad: Chop 2 eggs, add salt, pepper, and full fat mayo or salad dressing. Wrap deli meat around egg halves, slice eggs over a salad or enjoy them plain with salt and pepper. A hand-held instant snack with endless combinations. Grab your favorite sliced cheese and deli meat, add low carb condiments like mustard, cream cheese, mayo or salad dressing, then wrap or roll up. Make authentic Italian antipasto: Chop meat, cheese and veggies into bite-size pieces, then add olive oil, fresh herbs and spices. Store in a container in the fridge. Store in individual (carb-controlled) portions, especially if a higher-carb Italian dressing is added. Whip heavy cream or coconut cream with a splash of vanilla and add to a mug of low carb fruit or berries. Simply pouring the cream right over the fruit inside a mug works great. There are over 20 low carb fruit choices with less than 5 net carbs per mug-size serving. That’s not a typo. Yes – you can have it! This overly-simple low carb ice cream recipe works best when using a chilled bowl or container. Just 30 minutes in the freezer does the trick – your bowl is perfectly chilled. Place ¼ to ½ cup of your favorite frozen fruit into a bowl. Mix with a spoon for a few minutes. When frozen berries are added, the heavy cream also freezes – making an instant, low carb ice cream. Add a dash of vanilla, almond extract or cinnamon to bump up the flavor, or a few drops of stevia to sweeten. This keto snack works well away from home or in a pinch. Choose nitrate-free if possible, or even better: make your own. Wrap cooked bacon around chunks of cheese or raw veggies like asparagus or thick onion rings (candy-cane style). If you have time: Wrap uncooked bacon around bite-size portions of protein, secure with a toothpick and cook. Try chicken, meatballs, sausages, seafood or veggies. Dips and spreads require very little prep time and stay fresh in the fridge for days or weeks. Go for a variety: savory, salty, tangy, spicy and sweet. Try low carb salsa, smoked Gouda and bacon, onion and dill, artichoke, cheesy avocado, curry chicken, jalapeno or sweet onion. Lettuce leaves, hollowed-out tomatoes or peppers make easy ‘veggie bowls’ for dips. Veggie sticks are one of the laziest low carb snacks. Slice ahead of time, then store in containers in the fridge. Wrap veggies in your favorite low carb cheese. 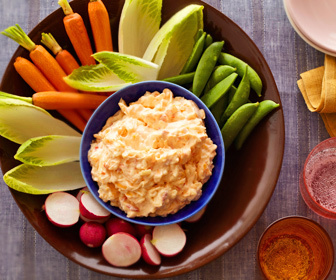 Dip into seasoned cream cheese, Ranch, Blue Cheese or other high fat salad dressing. See the lowest carb veggies for your best options. Craving an old-school “bread bowl,” sandwich, French toast, hamburger bun or muffin? Try Soul Bread with only 1 net carb per slice. Soul Bread isn’t anything like those eggy, floppy Oopsie rolls. Soul Bread is firm, holds up beautifully, freezes and stores very well. Choose all-natural, unsweetened chocolates over artificially sweetened or low carb versions. One teaspoon of unsweetened cocoa powder mixed with 3-4 tablespoons of heavy cream (whipped) and a dash of vanilla makes a delicious, low carb mousse. Use artificial sweeteners sparingly, if at all. Increase the cocoa for a darker chocolate version. Add 1 teaspoon of protein powder and ½ teaspoon of MCT or coconut oil for an extra fat-burning keto mousse. Snack wings are excellent low carb finger foods. Be creative with spices, seasonings and sauce. Try garlic Parmesan, stone-ground or peppered mustard, Italian, chili, spiced peanut, ginger, a splash of citrus or zest, or full-fat salad dressings, like Ranch or blue cheese. Cooked mini bites of your favorite appetizers require a little more effort, but provide savory snacks for weeks – saving time in the future. Prepare these snacks ahead and freeze in smaller portions. Mini meatballs, Little Smokies sausages, and pieces of nitrate-free hot dogs are favorites. Try a Jerk Caribbean spice, sugar-free barbecue sauce, orange zest or a tiny touch of molasses for flavoring. Eggs are edible, high fat containers. Deviled or stuffed eggs add incredible variety. Experiment with spicy Creole, tangy Southwest or sweet onion flavors. Stuff eggs with chopped meats and spices, chopped nuts or veggies. Mix yolks with full-fat condiments like salad dressing, mayo, mustard or flavored oils. Cremini and Portobello mushroom caps are high fiber, firm and best for stuffing. These mushroom caps are also porous, absorbing marinades and spices fully. Stuff caps with fresh ingredients or leftovers. Enjoy your caps cold or crispy-brown straight from the oven. Stuff with garlic, Italian seasoning, baked spinach, crispy bacon, veggies and cheese. Make the stuffing ahead of time, fill the caps, then refrigerate or freeze.